YouTube video freezes whenever I try it to play the video in full screen in my Ubuntu Maverick. It has been like that for a long time now and we have a solution finally. How to Fix YouTube Video Freeze While in Fullscreen in Ubuntu 10.10? The fix is rather easy. Simply do the following in Teriminal. Done. That fixed things for me. 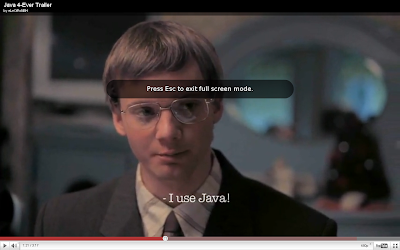 And if you have missed the video in the screenshot, well, here is it - Java4Ever Movie Trailer. It's a must watch.